If you’re old enough to remember the late nineties and the origins of the Kranked video series, you’re no doubt old enough to be a parent now, which is good because the Kranked crew is now making 20″ hardtails. The Kranked Ripper looks to meet the needs of the parents who remember freaking out whenever a new DVD was released where riders were pushing what could be done on a bike in every segment. 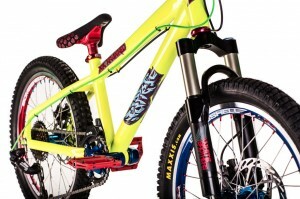 Given the limitations and general crappy quality of kid’s bikes today, it’s nice to see that Kranked is continuing to push progression, preparing the next generation of Rippers. The Ripper HT is a solid frame that is spec’d out in three flavours: HT3, HT2, and HT1, priced at $1299, $1599, and $1999 respectively. It’s also available as a frame only for those who are confident in their web-fu enough to source out compatible parts on their own, for $349. As you move up the line from HT3 to HT2, the extra money gets you better wheels and a slightly better shifter (Sram X5 to X7), but the derailleur remains the same (Sram X5). These additional features are nice to have, but given the weight of the intended riders and the cost of BMX rims, I can’t see the upgrades worth the $300 price bump. The real upgrade in spec comes when you step up to the HT1, which has a Sram X7 derailleur, Diety bars stems and grips, and most importantly, a White Brothers Rustler fork. While the derailleur and handlebars are nice to have, it’s the upgraded fork that makes the extra cash spent worthwhile. While the HT3 and HT2 come with a Suntour elastomer fork (think rubber bumpers), the Rustler is an air shock (think world cup racing) that is adjustable to the weight and riding style of your little grom and relatively light to boot. 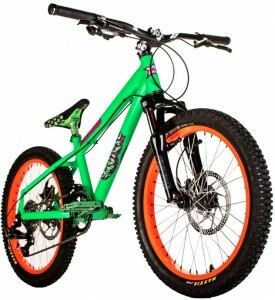 While neither fork is going to survive big impacts or dorps to falt, the Rustler is the best out there for 20″ wheels. The Parts – Normally I’d break the spec out into individual parts, but almost every part on this bike is more than capable of growing with even the most aggressive ripper. This parts spec is very impressive, starting on the HT3 and all the way up the line. Even the ‘downgraded’ cockpit on the HT2 and HT3 is all Race Face parts! When the ‘low-end’ parts are the same brand that are used daily by serious adult riders all over the world, you can be confident in your grom using them. 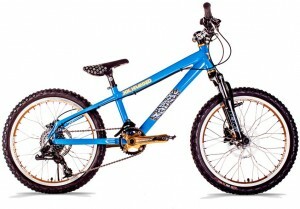 The Suntour XCT Jnr. fork on the HT2 and HT3 – The sad fact is that there are almost no decent 20″ forks made, and Kranked Bike’s inclusion of this fork is probably the best they could do to stay on a pricepoint. To their credit, in speaking with Kranked they tell me that they open up the forks and modify the internals so riders can get more than a few centimeters of the advertise travel, something common with elastomer forks. Either way, they’re still much better than rigid forks, and provide an upgrade path if some suspension manufacturer ever wants to pick up the ball and make one of their forks in a 20″ variety. ISCG mounts – The MRP chainguide is surely invaluable for groms who like the rough terrain, but an ISCG guid would be perfect for protecting the drivetrain and providing chainguide options. Kranked Bike’s tagline is “Every kid deserves a wicked bike“, and they back it up by offering three of them.